New adventures and excitement in southwest Ireland. Today we left early and headed to the Lillarney National Park with some of the most beautiful landscapes in Ireland. I gave my talk on “Creation Screams of Existence of God” (see below). We visited Muckross House and walked through The manicured gardens and pathways. Then 2 1/2 hours of free time in Kalarney for jaunting in the horse carts, fabulous lunches and exploring this beautiful city full of flowers and the Franciscan Church. 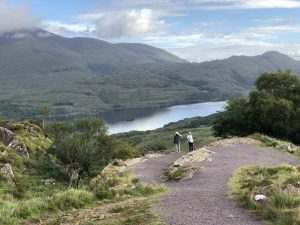 After our time in Killarney we boarded our buses and went for the beautiful drive around the southwest Peninsula of Kerry called the “Ring of Kerry“. Mass in Sneem village church, some free time and dinner and then to the local pub for Guinness and music and dancing with all the local folks.